The Marine grade 316 stainless steel and the welded strong aluminium frame, nothing presents as well as this product! Marine 316 Grade is far more durable in corrosive conditions that 304 Stainless (that some others use), ensuring you have the best looking product throughout its life. This, combined with the manufacturing feature of a welded frame, you will receive a high quality finish, with no untreated or raw edges to increase the risk of corrosion. Installed by an experienced fitter that ensures a quality end result! Prowler Proof Products come from a world class fully automated factory in Australia. This means that high quality is consistently managed across all products in Australia. Whilst many others supply raw material to local workshops to make doors up, Prowler Proof ensure a consistent high quality product for every customer! Contact Rhino Security Doors and Windows to see the samples, you will be impressed! Prowler Proof ForceField® is available as hinge doors, sliding doors and window screens, custom-made to your home. You have 300 colours to choose from, as well as a range of manufactured options. Your Prowler Proof dealer will guide you through the many options and help you make the right decisions. Lockwood 8654 is one of the strongest residential hinge door security locks on the market. It’s a 3-point locking system with Kinetic Defence Keying Technology and a 25-year mechanical warranty. If security is not a priority,ForceField® is available with a 1-point lock that does not meet the Australian Standard AS 5039† for security. † AS 5039 requires security doors to have a 3-point locking system with a 5 pin cylinder lock. With its seamless, clean design a ForceField® hinge door is almost like an invisible barrier. With an optional mid rail it turns into a visible barrier. The mid rail can be black or colour matched to the frame. The solid half panel can actually be any height you like. It can also be any colour you like – matched to the frame or black like the ForceField® mesh. Strength is not compromised in a solid half panel door, the panel is made of 1.2 mm solid aluminium. Petway pet doors are made of UV stabilised plastic. They come in three standard sizes – small, medium and large. You can choose from six colours: black, white, stone beige, primrose, brown and bronze. Prowler Proof pet doors come in three standard sizes – small, medium and large. But we can make it any size you like and almost any colour you like. The fully welded aluminium frame can be black or colour matched to the door. * Please note doors with a pet door do not satisfy the Australian Standard AS 5039 for security. Lockwood 8653 is one of the strongest residential sliding door security locks on the market. It’s a 3-point locking system with Kinetic Defence Keying Technology and a 25-year mechanical warranty. If security is not a priority,ForceField® is available with a 1-point lock that does not meet the Australian Standard AS 5039† for security. Sliding, double sliding, single or double hung, louvre, awning, casement …there’s a ForceField® product for almost any window. Your Prowler Proof dealer will help you choose from a range of manufactured options and 300 colour options. A cross brace can be used to complement the looks of your home. Choose between black to suit the ForceField® mesh or colour matched to the frame. The cross brace can be in any position you like. A mullion serves the same purpose as the cross brace…whatever suits your home better is the one to choose. The mullion can either be colour matched to the frame or black to suit the ForceField® mesh. The mullion can be in any position you like. The Petway hopper hatch is made of UV stabilised plastic and the opening is 114 mm high x 110 mm wide. It’s available in black and white. The Prowler Proof porthole is 120 x 120 mm. The frame is a 32 mm fully welded aluminium frame and the flap is made of clear tinted polycarbonate. The Prowler Proof porthole is available in black only. * Please note window screens with a hopper hatch or a porthole do not satisfy the Australian Standard AS 5039 for security. All ForceField® products come in 50 standard colours and another 250 optional colours. There is no extra delivery time and only a small premium on optional colours. Check out the standard colours below and use the colour selectors to see individual ForceField®products in your favourite colour. 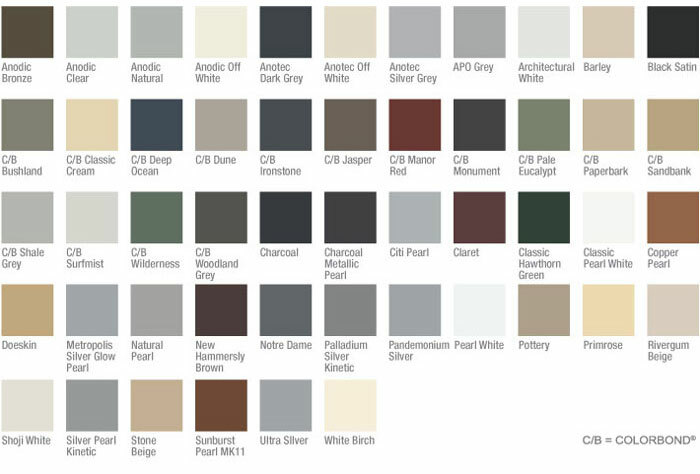 For more options please download the complete colour charts below.